Audio, biography, discography, links, and a bulletin board. allows artists who sell primarily on ebay to meet and gain exposure. most artists are self-taught or outsider artists. includes directory, portfolios, interviews, and exhibition and commission information. set up by an artists collective for other collectives and for individual artists on the web. a group of new zealand artists mainly from wanganui, who have joined together to provide a place for artists to show and sell their works both on the internet and with exhibitions. A loose association of artists, non-artists and anti-artists. information including a festival schedule, artists applications, press releases, contact information and an artists gallery. digital artists, traditional artists, photographers, writers, and poets forum. art in its many forms. see works by other artists and get great tips and hints. a group of professional artists showing a variety of work. artists can join this site. a massive gallery of graphic artists from around the world. includes a gallery, tutorials, pictures and interviews of artists, and resumes. A place where artists of all arts can go to see, submit, and hangout to see other artists work, including the authors. community of independent women artists, featuring monthly articles written by independent artists as well as interviews, cd reviews and an online searchable database with over 900 independent women artists/bands. a complete updated database of all irish art galleries with links to their irish artists work. collectors can track favourite artists and artists can seek representaion by irish galleries. a group of artists and craftspeople living in close proximity to each other in the relaxed rural setting of northern tasmania, australia. the artists all work from their own studios or workshops within two kilometers of each other. images, news, artists biographies, and information about weetah, including travel information. galleries and biographies of renownedÃƒâ€šÃ‚Â artists. the artists are listed in the order of their birth from 1450 to 1968. A community of professional and amateur henna artists have created Henna Tribe which has information about henna history, henna recipes, artists and suppliers listings, and a very active message board. Also includes galleries with artists work. national directory of links to visual artists, galleries, and art resources. a live/work community of artists in somerville, massachusetts. meetingplace for independent artists in various media, promotes and sells artists works. Short description of the movement and a list of artists. supports searches by artists, album or song titles, browsing by artists. One of the largest digital art rings on the web. A group of sites that are owned by artists of many fields. dallas artists showcasing their work, links to various artistic resources. featuring work in oil, acrylic, watercolor, and pastel by cape cod artists. saskatoon, gallery representing established saskatchewan artists, as well as some younger artists. portraits, city scenes and landscapes by several artists. text and image listings of contemporary artists. artists pay for the listing. If the business hours of VH1: Agnostic Front in may vary on holidays like Valentine’s Day, Washington’s Birthday, St. Patrick’s Day, Easter, Easter eve and Mother’s day. We display standard opening hours and price ranges in our profile site. We recommend to check out vh1.com/artists/az/id_1549/artist.jhtml for further information. 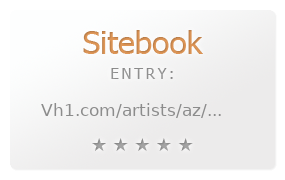 You can also search for Alternatives for vh1.com/artists/az/id_1549/artist.jhtml on our Review Site Sitebook.org All trademarks are the property of their respective owners. If we should delete this entry, please send us a short E-Mail.